Price: $1,37999 Free shipping Today! To help you enhance your gaming experience, make sure to use the Asus ROG Gunmetal+Weave Gaming Laptop that is designed with high-performance elements supported by the speedy Intel Core i7-8750H for your video-intensive applications and fast multitasking providing you a 2.20GHz processor speed. Get a roomy 1TB Hard Disk Drive capacity giving you an ample space for storing large game files. Enjoy handling system-intensive tasks, such as high definition video playback and gaming with an ultra-quick 8GB DDR4 system memory. Coupled with discrete video cards, the notebook provides a smooth gaming and multimedia experience. 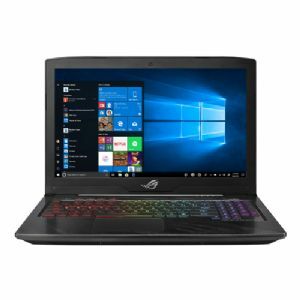 With Windows 10 Professional 64-bit operating system, this gaming laptop has a user-friendly and stable gamer environment that enhances your system performance. Experience high definition details in all your games or movies with its dedicated 4GB NVIDIA GeForce GTX 1050 Ti graphics. Moreover, it comes with an RGB (4-Zone) Keyboard and multiple media ports including USB ports, a Mini DisplayPort and an HDMI port to transform this computer into a multimedia machine making it the perfect choice for the latest games. Play harder with Asus ROG Gunmetal+Weave Gaming Laptop now!